UPDATE: Ariana Grande’s Latest Response. One Week Later. 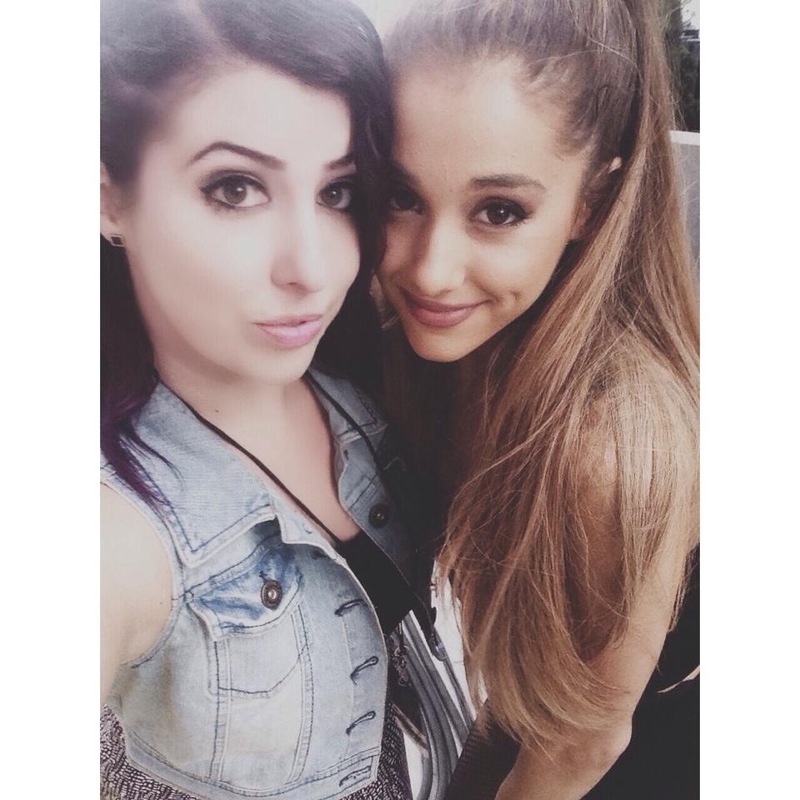 BRAND NEW UPDATE (08/29/2014) – ONE WEEK AFTER THE ARIANA GRANDE INCIDENT. WHAT HAS BEEN THE RESPONSE FROM MS. GRANDE AND HER REPRESENTATIVES? THE ORIGINAL POST, THAT SOMEHOW BECAME A NEWS ITEM, IS RIGHT BELOW THIS ONE. How has Ariana Grande responded to the disappointed MTV contest winners? That is the question I have received most over the past week. There have been a lot of questions, and I’ll try to answer them all here at once. This has actually become too big to even handle by a family without the power of a public relations army working for them. We have waited a week to answer these questions, as we didn’t want to rush into anything, and my daughters had faith that she would maybe just make a two minute phone call, so they could all explain their side, get past the whole thing, and the girls could concentrate on buying and enjoying her new album. Our family has been bombarded with interview requests all week – and up to this point have granted NONE. We had no desire to make this a bigger issue. Those few who have labeled us as “fame hungry” may not realize that we wrote a post, out of frustration, on a blog that used to get maybe 3 hits a day. We didn’t follow up until now, and we didn’t sell any interview to anyone. We just wanted to speak out for fans everywhere – even those who now hate and harass us. Treating contest winners as an annoyance is not really cool. This was not a case of interrupting a celebrity on the street, or in a restaurant, and it was not a large scale meet and greet of hundreds of people. It was three contest winners, with one guest each. That’s it. EVERYTHING in the original blog post occurred BEFORE she saw the artwork that featured her and Mr. Grande. The “only a selfie allowed” warning. The confiscation of any gifts intended for her, including one fan’s contest-winning CD of violin versions of Ariana songs. That young man poured his heart into that, and traveled across the country to hand it to her. The lack of banter with anyone – not even asking their names, or if they were the contest winners (as opposed to the guests). The ordering of security to be sure all non-selfies were DELETED. Heading off to leave after spending just seconds with each winner. ALL OF THIS OCCURRED BEFORE ANY ARTWORK WAS PRESENTED TO ARIANA GRANDE. They assumed Ms. Grande was aware of the artwork because it won the contest for Jen, and, as with the other young man’s violin CD, it came from a place of love. Jen wanted to give Ari the originals to keep. The other piece of artwork featured Ariana and Iggy Azalea, and it was this drawing that Ariana was looking at when she ordered all pictures deleted. She had not seen the grandpa drawing yet. When she did see the grandpa drawing, she walked out. Remember, she had been on the way out already, before Jen walked up to her with the artwork. She had taken the fan selfies and was on the way out. We believe that Ariana was affected in some way by seeing the artwork, we are not challenging that. It’s just that nobody knew it at the time, and it doesn’t really explain everything that went on before it. The fans were treated horribly before that final few seconds. So, to answer the above questions, there has been no contact at all from Ms. Grande to the fans in the week that followed. Here was the sum total of the phone call: Mr. Carozza asked me to update the blog by writing that we now understood why Ariana acted as she did – because of her being in mourning. When I asked him why I should do that considering that everything noted in the blog occurred BEFORE she saw the drawing, he responded that this post had become a legitimate news story and that it was Ariana’s album release week, and the story was making her uncomfortable. I told him that I was sorry for all that, but that my girls had been affected too – as they were receiving death threats. He reiterated the notion that Ariana had wanted to contact the girls after she had walked out on them, but that MTV had no way to deliver the “letter” she talked about. I reminded him that MTV knew exactly where the contest winners were staying for all three nights – as they had placed them in that hotel. They also had everyone’s phone number (that’s how Mr. Carozza got it to call us in the first place), home address, email address, and quite literally – their picture IDs and social security numbers. Perhaps the Ariana letter could have been sent over to the hotel when MTV had the VMA passes driven there two days after the meet and greet? I suggested that maybe Ms. Grande could phone the contest winners personally, for two minutes, just to have each side make nice, put it all behind them, and I could update this blog with a happy ending saying how Ariana reached out and acted like a true star. I could then write that the girls were excited to buy the new album. We still waited several more days, in the hope that, within all of her promotional fan interactions, she might still call, tweet, or send a note to the original winners, as part of her weeklong album release fan experience. I called Mr. Carozza as a final reaching-out gesture to see if any contact might happen soon, before writing this follow up. There is a happy ending to this, though. The happiness is not with the spurned contest winners, but with the fans who have met Ariana Grande since this blog became news. She has gone out of her way to meet many fans, with cameras rolling, surprising them at America’s Got Talent and the Today Show. Giving them VIP passes – on national television, singing happy birthday to one, hugging them all, taking Vines with them, doing repeated live chats, and telephone Q&A sessions. She also has tweeted several of them personally, and posted repeated tweets about how she loves all of her fans. The ones who earned a meeting with her through difficult contest entries, and follow up phone interviews, have received none of that. They have been forgotten by Ariana Grande and her huge publicity machine. They have no voice in this world except for this tiny blog page. I’ve been asked why I wrote it to begin with – well, Ms. Grande is famous for (rightfully) defending her family when they have been wronged. I chose to do that for my daughters, and the other contest winners. It’s that simple. But the happy ending is that, at least for now, some fans are being treated as actual human beings. That was the point from day one. For the few who call our family “liars” regarding all of this, I put this offer out there: Every one of us will take a public polygraph exam if Ms. Grande will agree to do the same. Every word I have written has been the absolute truth. We don’t have a corporate spin machine to twist the story, we don’t have the power to tell magazines and websites that we will refuse future interviews with them if they don’t slant the story our way, and we don’t have millions of fans who believe everything we say. We just know that if we tell the true story, there will be no guilt in our hearts. 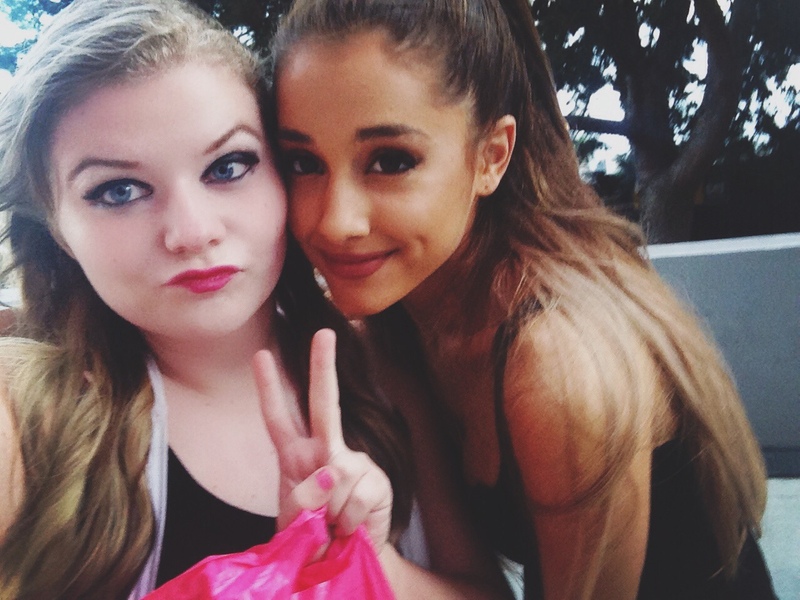 Meeting Ariana Grande, Then and Now. PLEASE READ NEW POST (CLICK PRIMAL SCREAMING HEADER ABOVE) FOR ARIANA’S LATEST RESPONSE (08/29/14) – Thank you. PLAY “ZOO PODCAST 9/12” AND FORWARD TO APPROX THE 60% MARK. THANK YOU. That’s what my 14 year-old daughter, Jen, exclaimed to me on a January day in 2011. Both Jen and her older sister, Kelly (then 19), were such big fans of Ariana. They enjoyed her in her role as “Cat” on the Nickelodeon show “Victorious”. Thought she was so charming and funny. But what they enjoyed even more was her singing. She wasn’t a pop star back then. She was a funny and talented supporting player on a comedy show. But my daughters watched Ariana’s homemade Youtube videos of her using her beautiful voice while singing other people’s songs. They showed the videos to my wife and I, and we were naturally impressed as well. We also watched “Victorious” with our girls. We knew Ariana Grande was destined for stardom. On that day in 2011, Ariana tweeted that she was excited that she would be visiting the Titanic exhibit at the Las Vegas Luxor hotel. We live 20 minutes outside of Vegas, so Jen practically begged me to drive over to the Luxor and wait outside the Titanic exhibit – for however long it took – so that she might see her idol. Kelly wouldn’t be able to come because she was already at work. Of course I said “yes”. The one rule I had was that, if we saw Ariana, we had to wait until she finished enjoying the exhibit and was ready to leave. I’m not one for intruding on anyone, celebrity or not. If Ariana were to tweet something like that today, there would likely be hundreds, maybe thousands, of fans waiting for her. On that day, before she was a superstar, there was only Jen. Jennifer O’Connor was an “Arianator” before it was even a term. We waited on a bench near the Titanic exit for hours. I read a book while Jen kept her eyes on the gift shop. “Oh gosh. There she is,” said Jen. She was actually shaking. We watched from a distance as Ariana, her mom, and one or two other folks paid for their purchases and began to exit. 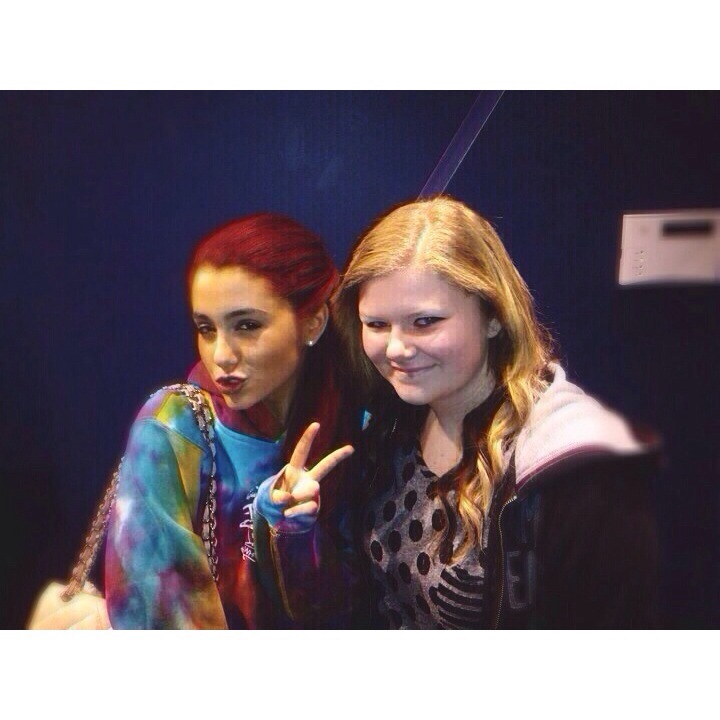 First Ariana stopped to slip on a hoodie she bought in the shop. Then they moved toward the exit. Ariana spotted Jen smiling at her. Jen didn’t have to say anything. They chatted for a minute or two, and then posed for a photo. Ari threw up a peace sign. I took the picture. Of course I re-took the photo. Ariana never asked to see or approve of either picture. Jen deleted the first one, without being asked to do so. She did it out of common respect. As they said their goodbyes, Ariana hugged Jen, and Mrs. Joan Grande actually thanked us for coming to meet her daughter. It was a wonderful experience, and Jen has told the world about it for years. Ariana Grande was one of the nicest celebrities we have ever encountered – and between originally living in New York, then Vegas, and our frequent trips to L.A., we have come across a lot of them. Flash forward to August, 2014. Ariana is a superstar. But surely she is still the same sweet girl where it matters most – in her heart. Maybe, maybe not. That’s how the contest was advertised. Contestants had to produce some art and say why they loved Ariana so much. They also had to follow and hashtag MTV, VH1, and Pepsi, label it as #ArianaNOW, and a few other things. Jen spent days working on artwork of Ariana, wrote why she loved her, and amazingly, became a finalist. She was then interviewed via phone by an MTV rep for the second stage of the competition, and a few days later was announced as one of the two MTV winners (there was another winner through VH1). All winners were permitted to bring a guest to L.A., so naturally Jen chose her older sister (another Arianator). The winners were placed at the Standard Hotel in Hollywood. They were told to get to the L.A. Forum in Inglewood for a 5 PM meeting with Ariana. They had to provide their own transportation. Jen and Kel arranged for a taxi to take them. They know that Los Angeles traffic is horrific so they left extra early from the hotel so that they wouldn’t miss the event that they were so excited for. Jen brought her winning artwork because she wanted to give it to her idol. She also wanted to remind Ariana of their prior meeting by the Titanic exhibit, when it was just Jen, Ariana, and that cute hoodie. Jen and Kel got to the Forum early, as traffic wasn’t as bad as they had been warned. They were not allowed inside, or even permitted to wait in the safety of the parking lot. Fair enough – though probably not hospitable or decent, it was never promised that they’d be let in early. At least they knew they wouldn’t be late, and miss the chance to “hang” with Ari. Turns out, they were never permitted in the building at all. An MTV staff member in a big tent said “You can’t stay here. I don’t know where you can go, but it can’t be on the property. Also, this neighborhood is unsafe so be careful out there.” At some point later, they were allowed into the parking lot, where all the winners and guests stayed, being shuffled from table to table as more “important” people appeared. They waited till around 7:30, outdoors, for the meeting with Ariana. They were all hungry and cold, and despite a huge party barbeque going on in the tent beside their benches, they were offered nothing but a bottle of water the entire time. Still, no problem – that’s life sometimes. Some folks care, some don’t. Jen and the other MTV winner (a young man of 16 who traveled across the entire country for this meeting) were interviewed on camera by MTV to be broadcast at a later date. Before the camera rolled they were told they would be asked what it was like meeting Ariana, and they had to PRETEND that they had already had said meeting – even though the interview was taped BEFORE Ariana ever appeared. They were told what to say, almost word for word. I know Jen feared that if she refused to do this, she would not meet Ariana (though she was not told that). That, my friends, is known as a RED FLAG. Remember, these are not kids who interrupted Ariana during dinner at a restaurant, they are pre-screened contest winners who poured their hearts into their winning entries. The 16 year old boy had recorded a CD of beautiful violin cover versions of Ariana songs. It won the contest for him, and he wanted to present it to her. It was taken away by security. Ariana Grande, the superstar, then walked toward her three contest-winning fans. Ms. Grande glanced at the photo on Jen’s phone and said, “Let’s redo that picture.” She said nothing else, so Jen retook the photo. No peace sign from Ari this time. Then Jen took out one of the drawings that won the contest for her. Kelly snapped a photo of her smiling little sister giving Ariana the drawing. “Delete those pictures, please” was all Ariana said. “Can I just keep the one of my sister showing you the drawing?” asked Kel. Then, Ariana Grande walked away from her prize-winning fans without even saying goodbye. That was it. That was HANG WITH ARIANA GRANDE, as the contest ads had screamed. The MTV reps on scene seemed startled, but at a loss for what to do. CRYING would turn out to be the unspoken answer for most of them. What did MTV, VH1, Pepsi, or Ariana Grande do to rectify this disaster? So far, nothing. The weekend continued. On Sunday, the winners received passes to the MTV Video Music Awards (which was part of the prize all along). They were seated three rows from the back of the top balcony, possibly closer to the sun than the stage. I had told them to expect that, though. The fact that one of the winners was somehow awarded better seats than the others, seated among industry insiders, and given wristbands for he and his guest for free food and drink during the show is a mystery that was not specified as a prize, and was likely just another MTV oversight – along with letting all the contest winners out of the car that brought them to the show in a Sizzler parking lot several blocks from the Forum. They were told to hoof it to that same lot after the show, in their new outfits and shoes. How glamorous. Do you think that MTV might have offered to place the winners up close in the pit in front of the stage with hundreds of radio contest winners? You know, to make up for the terrible meeting experience? Nope – they stuck ‘em up in the rafters. Polite texts were sent to several MTV reps, and tweets to both Ariana and her mother, desperately asking for something to be done. Some type of re-do, or perhaps a meet n greet with some other, more fan-friendly, celebrity. It is understood that this was a meet n greet. Nobody expected Ariana Grande to become their best friend, or to even spend 15 minutes with the group of contest winners (though that wouldn’t seem to be an insane request), but 15 seconds each, followed by barked orders to delete photos, and an abrupt exit, doesn’t seem to really epitomize such an event either. Jen and Kelly have encountered many celebrities, just passing on the street, that have spent more time with them than Ariana did with her contest winners. These include Ashley Tisdale, Chris Kirkpatrick from *NSync, Brandon Flowers of the Killers, Brad Garrett, Nicolas Cage, Weird Al Yankovic, Ariana’s “Victorious” co-stars Leon Thomas and Mikey Reid, and many more. Every one of them kind and engaging. Jen met Ari’s “Sam and Cat” co-star, Jennette McCurdy, at an event and was knocked out by how sweet she was. She asked Jen questions about herself and chatted about a variety of things. Jen tried to move along to give time to other fans, but Jennette actually called her back to talk more about her artwork. Same with Miranda Cosgrove – a complete sweetheart. In 2003, Jen and Kel received an opportunity to meet a superstar even more famous than Ariana Grande. They met Britney Spears. Wanna know how that went? Britney invited our two girls into her dressing room at MTV’s TRL. She spent between 12 and 15 minutes with JUST THEM and her assistant Felicia. Then Britney invited my wife and me to come in as well. We all took a bunch of pictures, from any angle, while Britney chatted with the girls, looked through pics of their memorabilia, happily personally accepted a gift bag they had brought for her, answered any questions they had, gave them each a signed copy of her CD (which was released that day), and personally made sure that Jen and Kel could watch the live taping of TRL in the studio, even though they were both too young according to MTV policy. Neither Britney, or any member of her staff, ever asked to see any of the pictures we took. In fact, her security guard remained OUTSIDE the entire time we spent with her. That is a true superstar who loves her fans. We did not expect Ms. Grande to be as gracious as Britney, but 15 seconds and a silent walk-off? Jen also once won a contest to spend the afternoon with Disney star Ryan Ochoa (“iCarly”, “Pair of Kings”…) at Knotts Berry Farm. We expected that Ryan would be there for an hour, maybe two, and that would be fine. He showed up with his dad and his brother and they stayed with Jen for EIGHT HOURS. They wanted to stay longer but I insisted that they had done more than enough and I was actually embarrassed at their kindness. Then they set our whole family up with front row seats to a taping of “Pair of Kings”. We met the entire cast after the show. They were all amazing and friendly. Ryan Ochoa and his family have become our friends now. We see them whenever they are in Vegas, and sometimes when we are in L.A.
We did not expect Ms. Grande to become friends with any of the contest winners, or to spend eight hours with them, or give them any type of tickets for anything. Some might say she was having a bad day. But what about the day after, and the day after that? The fans were all still in Hollywood, awaiting the VMAs. All involved knew that very well. Could Ariana have met them again? Could she have just sent them a personal tweet, or had a letter driven to the hotel? A signed CD? Could she have sent out a general tweet about meeting some huge fans? None of that has happened. The contest winners have been completely ignored. Nobody expected Ariana Grande to spend a whole hour with them, or give them her phone number, or even follow them on Twitter. But 15 seconds and a silent walk-off? We’re waiting to see if Ariana, her mom, MTV, VH1, or Pepsi will do anything at all to rectify the injustice done to these disappointed fans and their guests. It’s a terrible thing to be treated that way by your idol. They deserve something. Maybe five minutes with a celebrity who cares. Jen and Ariana. Titanic exhibit, Las Vegas 2011. Jen and another contest winner being interviewed by MTV, BEFORE they met Ariana. Our entire family with Britney Spears at MTV studios, NYC, 2003. 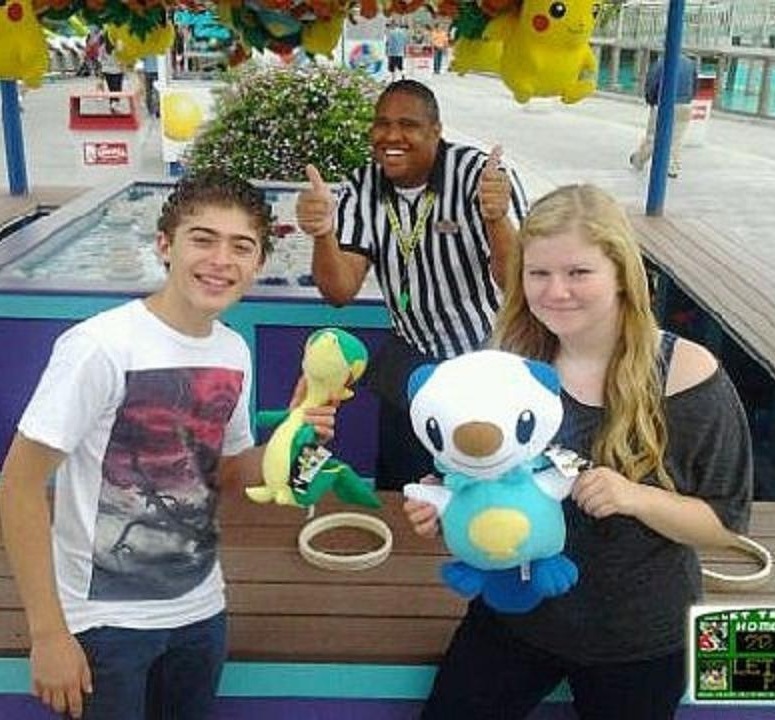 Jen with Ryan Ochoa at Knott’s Berry Farm, 2011.